When Sue Halpern decided to emulate the ﬁrst modern scientist of memory, Hermann Ebbinghaus, who experimented on himself, she had no idea that after a day of radioactive testing, her brain would become so “hot” that leaving through the front door of the lab would trigger the alarm. This was not the ﬁrst time while researching Can’t Remember What I Forgot that Halpern had her head examined, nor would it be the last. 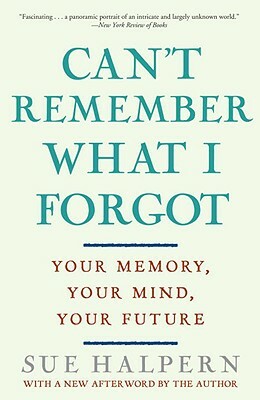 Like many of us who have had a relative or friend succumb to memory loss, who are getting older, and who are hearing statistics about our own chances of falling victim to dementia, Halpern wanted to ﬁnd out what the experts really knew, how close science is to a cure, to treatment, to accurate early diagnosis, and, of course, whether the crossword puzzles, sudokus, and ballroom dancing we’ve been told to take up can really keep us lucid or if they're just something to do before the inevitable overtakes us. Sharply observed and deeply informed, Can’t Remember What I Forgot is a book full of vital information and a solid dose of hope. SUE HALPERN is the author of Four Wings and a Prayer, Migrations to Solitude, and two books of ﬁction. "Educational, fabulously well written, and on a hot topic. Highly recommended for both public and academic libraries."